Cincinnati Financial (CINF) was formed in 1950 and is among the top 25 U.S. property casualty insurers today, offering business, home, and auto insurance. Insurance companies make money by writing and selling insurance policies (which typically break even or lose money for most insurers), and investing policy proceeds for income until claims need to be paid out (this is where the money is really made). Local independent insurance agencies market Cincinnati Financial’s policies within their communities, which span across more than 40 states. The company’s revenue mix in 2017 was 55% commercial, 22% personal, investment income 11%, 4% life, 4% excess & surplus and 5% investment gains and other. By state, 16% of Cincinnati Financial’s premiums came from Ohio, 6% from Illinois, 6% from Indiana, 6% from Georgia, 5% from North Carolina, 5% from Pennsylvania, and 5% from Michigan. The company ended 2017 with a combined ratio of 97.5%, which is in line with its target range and also marks the company's sixth consecutive year of underwriting profit. Impressively, Cincinnati Financial's results once again exceeded the estimated property casualty industry aggregate of 105%, as per A.M. Best. In fact, as you can see below, the firm’s combined ratio (dark blue) has meaningfully outperformed the industry (yellow) in the past five years, demonstrating Cincinnati Financial's disciplined risk management practices. The company has also produced 29 years of favorable loss reserve developments, which means it has conservatively booked more losses than it has actually realized each year. This is yet another sign of management’s conservatism. Cincinnati Financial has over 1,700 agency relationships in more than 2,200 locations across the country and does everything possible to support them. The company doesn’t compete with agencies by selling online or direct to consumers and instead employs more than 3,200 headquarters associates who provide support to over 1,600 field associates (there has also been a 31% increase in field staff since the end of 2012). As a result, Cincinnati Financial is the number one or number two carrier by premium volume in 75% of agencies partnering with it for five years or more, although an agency may represent dozens of carriers. As seen below, Cincinnati Financial has also been effective at expanding its market share with agencies over time. Cincinnati Financial says that its net amount of agency relationships has increased by 44% since the end of 2009 and that it still only has about 9% market share of the estimated $54 billion total P&C premiums produced by currently appointed agencies, leaving plenty of room for future expansion of relationships. One of the things to like about Cincinnati Financial is that it has only a minimal presence in California and Florida. Most of its operations are in the Midwest, perhaps reducing its exposure to major catastrophes. 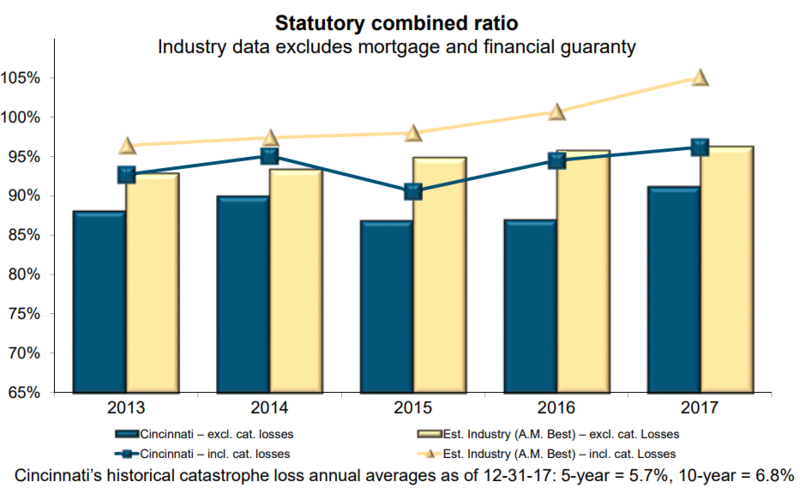 The wildfires in California and several major hurricane events in Florida last year caused the industry's combined ratio to spike well above 100% (an underwriting loss), but Cincinnati Financial's favorable geographic mix allowed it to continue turning out an underwriting profit. Cincinnati Financial must put up with this cyclicality and remain disciplined with its pricing of risk and balance sheet strength (the company maintains an investment grade credit rating), regardless of market conditions. Underwriting aside, Cincinnati Financial does have more risk with its investment portfolio than many other insurers because it has around 36% of its portfolio invested in common stocks (most other insurers invest 10%-20% of their portfolio in stocks). The portfolio is diversified (no stock is more than 4% of the portfolio) and invested in many quality dividend growth stocks, but these investments are still more volatile than a portfolio with a higher mix of investment-grade bonds. Finally, it’s worth noting that while the insurance industry is generally slow to evolve, it is changing. Technology is leading to more advanced data models that are pricing risk more efficiently on a policy-by-policy basis, which will only result in more competition for accounts with the best risk profiles. Cincinnati Financial is also completely dependent on independent agencies to sell its insurance policies. According to the Independent Insurance Agents and Brokers of America, independent agencies write about 60% of overall U.S. property casualty insurance premiums today. However, more policies will likely be purchased online over the coming decade, and a number of "InsurTech" upstarts are looking for ways to disrupt the industry's status quo. Selling policies online could actually result in lower prices and greater profits for insurers because they do not need to pay commissions and can save labor costs as well. To help mitigate this risk, Cincinnati Financial partners with numerous startup incubators and deliberately focuses on insurance lines of business that are more likely to need an agent: personal lines high net worth, commercial lines key accounts and excess and surplus lines business. Overall, Cincinnati Financial’s financial conservatism and long-standing customer and agency relationships help reduce many of these concerns. That’s why Cincinnati Financial is a favorite pick for income investors. The company is a proven, well-managed insurance business that has been a sound bet for safe, growing dividend income with 57 consecutive years of higher payouts. Only seven U.S. public companies can match this record. While the insurance industry will continue experiencing its fair share of performance cycles and needs to adapt to technological changes going forward, Cincinnati Financial has proven to be a disciplined risk taker with both its underwriting and investment portfolio.